Intraocular lenses commonly called IOLs, may be one of the most important ophthalmic developments in the past 30 years. An estimated 90 million people have nearsightedness so severe that it cannot be corrected with Custom LASIK or other procedures. Most non-LASIK candidates can overcome their vision limitations with a phakic intraocular lens implant. This implant was designed to correct moderate to severe (5-20 diopters) degrees of nearsightedness. It is placed behind your cornea and works along side your natural crystalline lens. A phakic intraocular lens may offer high quality, high-definition vision and minimize your dependence on glasses or contact lenses. What is a phakic intraocular lens (IOL)? The phakic IOL is a micro lens placed behind your cornea. It is made out of PMMA, the same material used safely for the past 50 years in cataract surgery. “Phakic” means that your natural crystalline lens is left in the eye. Your natural lens helps your eye adjust between seeing objects that are near or far. Patients older than 21 years of age who pass a rigorous preoperative assessment and who have nearsightedness between 5.0 and 20.0 diopters of myopia and no more than 2.5 diopters of astigmatism may be candidates. The overall health of your eye will be determined along with the depth of the anterior chamber where the lens will be placed and the number of endothelial cells on the back of the cornea. An outpatient treatment, the procedure takes around 20-30 minutes. One eye is treated at a time. The other eye can be treated within a few days. A small opening will be made in the peripheral iris by a special laser prior to the day of surgery in the doctor's office to minimize glaucoma or elevated eye pressure. On the day of surgery, eye drops will be given to reduce your pupil size. For better access to your eye, the surgeon will use an instrument to comfortably hold your eyelids open during the procedure. A local and/or IV anesthetic is given, so the procedure should not be painful. General anesthesia is usually not necessary but can be done if the patient desires. A micro incision is made in the cornea for the IOL to be placed into the anterior chamber (fluid filled space behind the cornea and in front of the iris or colored tissue of the eye). The lens is centered in front of the pupil and is gently attached to the iris without sutures by spreading the specially designed arms of the optic to hold a small amount of iris tissue. This will hold the lens in place. The small incision is closed with microscopic stitches that dissolve on their own. A temporary shield will be placed over your eye to protect it during the time just after the procedure. What is the difference between phakic IOL and LASIK? Phakic IOL is specifically designed to provide precise vision correction for very nearsighted people who are not candidates for Custom LASIK. The corneal shape is not altered. A specially designed IOL is placed inside the eye to refocus light rays onto the retinal surface similar to glasses or contacts. 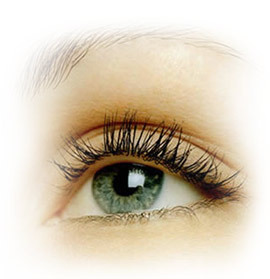 LASIK is an excellent procedure for people with lower levels of nearsightedness. The corneal curvature is altered to correct the nearsightedness and/or astigmatism. How many patients have had the phakic IOL procedure? The basic phakic IOL design has been successfully used in South America for 18 years and more than 750,000 phakic IOL procedures have been performed worldwide. In the United States , clinical studies of the phakic IOL procedure began in 1997 and approximately 1000 procedures have been performed as of January 2005. It was FDA approved in September 2004 after these clinical studies proved that the phakic IOL procedure is a safe and effective way to reduce your need for thick glasses and contact lenses. Is the phakic IOL procedure painful? Local anesthesia is used to numb your eye prior to surgery so most patients experience minimal discomfort during the procedure. Although some discomfort is normal during the healing process, the vast majority of patients experience little pain after the procedure. If you have specific questions or concerns, please discuss them with the doctor. Can I see well up close and at a distance with a phakic IOL? For patients 45 years or younger, you will be able to see at a distance and up close after surgery because your natural crystalline lens is left in place allowing natural adjustments to focus on near and distant objects. After age 45, you can expect to need reading glasses for close work just like other people who see well at distance at this age. Will I be able to see or feel the phakic lens in my eye? Once implanted, the lens is virtually undetectable. You and others close to you may be able to see the lens in your eye by looking very closely. Because the lens is placed behind your cornea inside the eye, you will not be able to feel it. Does the lens require maintenance? Unlike contact lenses, the intraocular lens does not require any maintenance. It is extremely important to attend all follow-up appointments and schedule annual exams with your surgeon to help ensure your long-term vision health. Can the phakic lens slip or fall out? Once implanted, the lens will not fall out. The lens is extremely secure because it is carefully attached to your iris. There have been rare occurrences of the lens becoming detached from the iris. If this occurs, you would notice a decrease in vision. The lens could then be easily reattached to the iris by your surgeon. How long does the phakic lens last? The phakic lens is designed to provide permanent vision correction. It will provide high quality vision as long as the eye does not suffer from other vision health problems such as cataracts or macular degeneration later in life. If cataracts develop, the lens would be removed at the time of cataract surgery and routine cataract surgery then performed by your surgeon.